As per usual Bella Jewel doesn’t disappoint and has stunned me once again. She held me captive with this romantic suspenseful story. The Watcher had me on the edge of my seat. I was kept guessing as the danger elevated one frightening moment at a time. Read this book! It will give you chills and have you on the ignoring everything just so you can turn the page again. 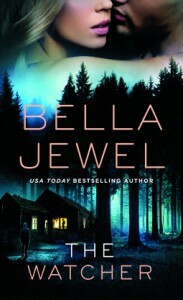 Jewel has created a bone chilling story that will have you looking over your shoulder. Grab it now you won’t be disappointed.